Please refer to our stock # 1686pr when inquiring. 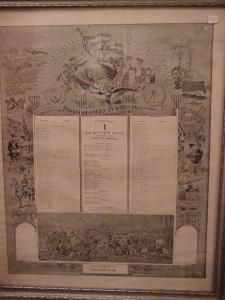 Spanish American War of 1898; honors the 2nd Texas Regiment, Volunteer Infantry, Garrity Rifles. These Americans are considered heroes, all volunteers; they won a war. The only unhappy people as a result are the Spaniards. 22.25" x 18.25" $425.